Arthur Miller published The Crucible in 1953, and debuted it that year at the Martin Beck Theater in New York City. He wrote the play in part to renounce the unfair tactics of congressional committees investigating Americans suspected of subversive behavior. The House Un-American Activities Committee, established in 1938, began holding hearings in the late 1940's to identify Americans with communist sympathies, focusing on Hollywood actors, directors, and writers. Witnesses who refused to identify acquaintances exhibiting suspicious behavior were blacklisted, a penalty that ruined reputations and made it difficult for many in the film industry to get work. When Senator Joseph R. McCarthy began conducting his own investigation in the U.S. Senate in the 1950's, he accused hundreds of innocent people of having communist ties, using tactics not unlike those used in the Salem witch trials. For example, instead of asking a witness “Are you a communist?” he was more likely to ask “Are you still a communist?” The insertion of the word still made it impossible for a witness to answer yes or no to the question while maintaining his innocence. In response to McCarthy’s unfair tactics, journalists coined the termMcCarthyism to describe the use of groundless evidence and accusations in public inquiries. Miller himself appeared before Congress in 1956 but refused to provide the names of persons under suspicion. He was found guilty of contempt, but he appealed the verdict and was exonerated. 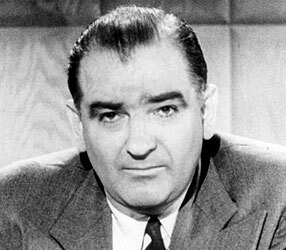 While the House Un-American Activities Committee had been formed in 1938 as an anti-Communist organ, McCarthy’s accusations heightened the political tensions of the times. Known as McCarthyism, the paranoid hunt for infiltrators was notoriously difficult on writers and entertainers, many of whom were labeled communist sympathizers and were unable to continue working. Some had their passports taken away, while others were jailed for refusing to give the names of other communists. The trials, which were well publicized, could often destroy a career with a single unsubstantiated accusation. Among those well-known artists accused of communist sympathies or called before the committee were Dashiell Hammett, Waldo Salt, Lillian Hellman, Lena Horne,Paul Robeson, Elia Kazan, Arthur Miller, Aaron Copland, Leonard Bernstein, Charlie Chaplin and Group Theatre members Clifford Odets, Elia Kazan, and Stella Adler. In all, three hundred and twenty artists were blacklisted, and for many of them this meant the end of exceptional and promising careers. CONTEXT & ORIGINS OF THE SALEM WITCH TRIALSBelief in the supernatural–and specifically in the devil’s practice of giving certain humans (witches) the power to harm others in return for their loyalty–had emerged in Europe as early as the 14th century, and was widespread in colonial New England. In addition, the harsh realities of life in the rural Puritan community of Salem Village (present-day Danvers, Massachusetts) at the time included the after-effects of a British war with France in the American colonies in 1689, a recent smallpox epidemic, fears of attacks from neighboring Native American tribes and a longstanding rivalry with the more affluent community of Salem Town (present-day Salem). Amid these simmering tensions, the Salem witch trials would be fueled by residents’ suspicions of and resentment toward their neighbors, as well as their fear of outsiders. Did You Know?In an effort to explain by scientific means the strange afflictions suffered by those "bewitched" Salem residents in 1692, a study published in Science magazine in 1976 cited the fungus ergot (found in rye, wheat and other cereals), which toxicologists say can cause symptoms such as delusions, vomiting and muscle spasms. In January 1692, 9-year-old Elizabeth (Betty) Parris and 11-year-old Abigail Williams (the daughter and niece of Samuel Parris, minister of Salem Village) began having fits, including violent contortions and uncontrollable outbursts of screaming. After a local doctor, William Griggs, diagnosed bewitchment, other young girls in the community began to exhibit similar symptoms, including Ann Putnam Jr., Mercy Lewis, Elizabeth Hubbard, Mary Walcott and Mary Warren. In late February, arrest warrants were issued for the Parris’ Caribbean slave, Tituba, along with two other women–the homeless beggar Sarah Good and the poor, elderly Sarah Osborn–whom the girls accused of bewitching them. SALEM WITCH TRIALS: THE HYSTERIA SPREADSThe three accused witches were brought before the magistrates Jonathan Corwin and John Hathorne and questioned, even as their accusers appeared in the courtroom in a grand display of spasms, contortions, screaming and writhing. Though Good and Osborn denied their guilt, Tituba confessed. Likely seeking to save herself from certain conviction by acting as an informer, she claimed there were other witches acting alongside her in service of the devil against the Puritans. As hysteria spread through the community and beyond into the rest of Massachusetts, a number of others were accused, including Martha Corey and Rebecca Nurse–both regarded as upstanding members of church and community–and the four-year-old daughter of Sarah Good. SALEM WITCH TRIALS: CONCLUSION AND LEGACYThough the respected minister Cotton Mather had warned of the dubious value of spectral evidence (or testimony about dreams and visions), his concerns went largely unheeded during the Salem witch trials. Increase Mather, president of Harvard College (and Cotton’s father) later joined his son in urging that the standards of evidence for witchcraft must be equal to those for any other crime, concluding that “It would better that ten suspected witches may escape than one innocent person be condemned.” Amid waning public support for the trials, Governor Phips dissolved the Court of Oyer and Terminer in October and mandated that its successor disregard spectral evidence. Trials continued with dwindling intensity until early 1693, and by that May Phips had pardoned and released all those in prison on witchcraft charges.